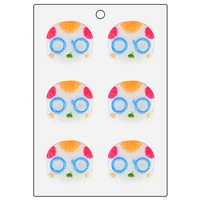 The Decorative Skull Mini Mold was inspired by Mexican sugar skulls, which are used to help celebrate the Day of the Dead! 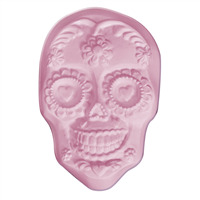 Create a soapy, sugary scare great for Dia de los Muertos or Halloween. 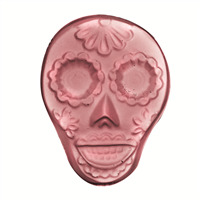 Bar Cavities: 6 Bar Depth: 0.9"
Bar Length: 2.3" Bar Width: 2.3"
The Day of the Dead Skeleton Mold is a beautifully detailed mold that represents a sugar skull to honor our loved ones on the Día de los Muertos. Make this mold pop by painting it with brightly colored mica powders! Bar Depth: 0.875" Bar Length: 3.125"
The sugar skull is a Mexican symbol celebrated on Dia de los Muertos which translates to Day of the Dead. Typically, the skull is painted with bright colors and is used to honor and celebrate those who have passed. This mold is perfect for the holiday or for Halloween time! Bar Depth: 1" Bar Length: 4.25"